A prominent Chinese human rights lawyer is said to have gone missing on the day he was due to be released from prison. Two of Mr Jiang's supporters went to collect him from prison in Henan province, but were told by police he had already left. Neither they nor Mr Jiang's wife - who is in the US - have been able to contact him. His wife says she is also concerned for Mr Jiang's father and sister, whose phones have been switched off. Mr Jiang was jailed two years ago on charges of subversion of state power and defaming China's political system, in a trial dismissed by human rights groups as a "sham". His supporters say police outside his jail had told them he had been "taken away", but did not specify by who. Mr Jiang's sister and father had planned to meet him outside the prison, said his wife, but both have gone missing as well and have been unreachable since Wednesday. "I was hoping and waiting for Jiang's release from prison," Jin Bianling told AFP. "I didn't expect him to go missing after serving his sentence." Mr Jiang was an outspoken critic of the government's 2015 crackdown on dissenters, representing some of those rounded up. It is estimated that more than 300 lawyers, legal assistants and activists were questioned at the time, and more than two dozen of these pursued as formal investigations. China has continued to clamp down on human rights activists and lawyers in the country, with the sentencing of Wang Quanzhang, another well-known Chinese lawyer, to four and a half years in prison for "subverting state power" last month. Mr Jiang defended human rights activists and fellow rights lawyers as well as also Falun Gong practitioners and Tibetan protesters. Mr Jiang was put on trial in August 2017 where according to state media he read out a confession, telling the court he attended overseas training sessions encouraging him to reject China's political system. Human rights groups have described the trial as an effort to discredit the lawyer as a part of what critics describe as China's "war on law". 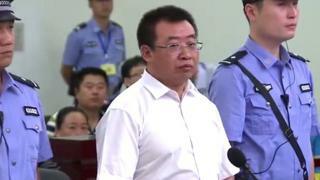 Video What happened to China's arrested rights lawyers?